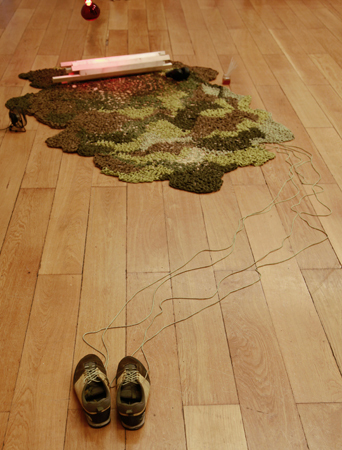 A carpet made with hiking shoes laces, my hiking shoes, pine wood trucks, IR lamp, fan, pine honey, immersive headphone, sound of the forest and smell of forest undergrowth. 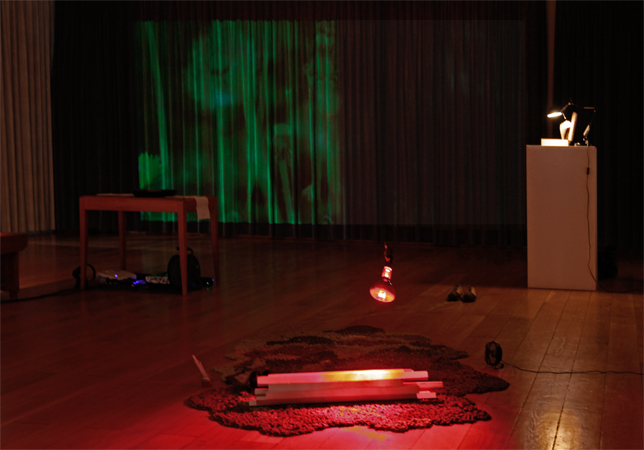 Komorebi is an immersive art installation that tends to offer an escape from the urban and noisy exhibition context. It works in opposition to the stress that one feels. Through a multi-sensorial approach this installation seeks to bring each visitor to the middle of a forest so as to have a bit of rest and quietness. Jeanne Goutelle, a textile artist, created the carpet with shoes laces. This carpet recreated the softness of moss and played by contrast with the hard concrete floor of the exhibition space. A stick of pine honey brings a bit of taste of the forest. An IR Lamp gives the feeling of a warm sun on your face. The wind of a small fan skims your legs. A sound recording projects the visitor between the cracking of the trees and the birds singing. Finally one can smell the fragrance design by Laurence Fanuel that reminds you the forest undergrowth: a mixed of humidity, mushroom, leaves and humus. Firstly visual, this installation looks artificial and very human made. It does not try to mimic the nature appearance but to re-enact all the sensorial imputes that one can have into the forest. As soon as you start to lie down and close your eyes, one feels enough confortable to escape from its everyday worries through the power of smell. Nevertheless, some mosquito attacks that sometimes appear along the soundtrack, remind to us that « The Call of the Wild » is not an easy-going experience. Humans might be desperately weak when they have to face nature for real. This immersive installation tries to keep the balance between true feelings and artificial forms so as to reminds us to accept the poetry of art but not to fall into the dead-end of romanticize the real.